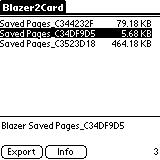 The exported page will appear in the root directory of the first VFS card on the system. It's name will be the same as the bookmark's name to avoid overwriting problems. To see what each, cryptically named, bookmark contains use the info button. Tested on a TX (Palm Blazer version 4.3) but it should work with others. If not, let me know and I'll try to fix it. On files where the HTML part is larger than 32k, a bunch of junk characters will appear at the end of the html file. This is a known bug and I'm working on it. v0.3: Added the ability to edit the export path. Removed the need for a temporary file on the card. v0.4: Added preliminary support for multipart files. v0.4a: Small fix on the file size problem. Now only the HTML component of a file needs to be smaller than ~32kb. UI changes. v0.5beta2: Bug fixes, UI Changes, code cleanup.